Before I begin, I would like to call on everyone to join me in expressing our deep condolences on the tragic death of 22 victims of the bomb explosion in Manchester last night and our heartfelt sympathies go to the injured and the bereaved families. Today, President Xi Jinping, Premier Li Keqiang and Foreign Minister Wang Yi sent messages of condolences to Her Majesty The Queen, Prime Minister May and Foreign Secretary Johnson respectively. I would like to stress that at this time of difficulties, the Chinese people stand firmly together with the British people. 2017 is a special year with important landmark events. For Europe, it is a year of elections. Now that the UK is joining in, the air resonates with appeals to voters right across Europe. For Britain, it also means the beginning of the Brexit negotiation. For China and Britain, 2017 marks the 45th anniversary of our Ambassadorial diplomatic ties. It is also a year for consolidating the "Golden Era" of our bilateral ties. For Hong Kong, this year marks the 20th anniversary of its return to China. Also in this year, the fifth Chief Executive of Hong Kong SAR has been elected. 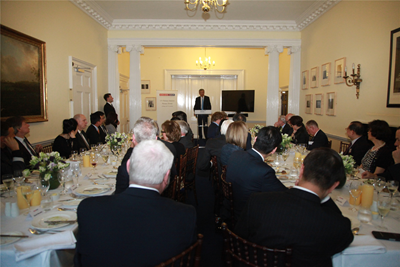 To celebrate the 45th anniversary of China-UK Ambassadorial relations, the Chinese Embassy in London hosted a series of events. This included a picture exhibition. Among all the photos of historical moments in these 45 years, the one showing the handover of sovereignty over Hong Kong attracts much attention. "As before: Horses continue to race. Stock traders continue to trade. And dance balls continue their merrymaking." Two decades on, I think this still holds true in Hong Kong. The only difference is that "the horses run faster, the stock trade grows bigger and the dancing is merrier!" All these advances have been possible because of the principles established in the handover of Hong Kong from UK to China. In the past twenty years, we have witnessed the "One Country Two Systems" policy making a huge success in Hong Kong. The Central Government of China has consistently and strictly adhered to the Constitution and the Basic Law. The commitment remains unchanged by the Chinese Government to the "One Country Two Systems", "Hong Kong people governing Hong Kong" and "high degree of autonomy". This commitment has been the fundamental guarantee for Hong Kong's continued prosperity and stability. The past twenty years have witnessed how Hong Kong continues its global leadership and economic strengths. Hong Kong continues to be a key global centre of shipping, finance and trade. Hong Kong remains one of the world's most competitive economies. Hong Kong has, with the strong backing of the Chinese Central Government, consolidated its economic strengths and withstood the tests of the Asian financial upheavals and the international financial crisis. The past twenty years have witnessed the steady advance of rule-based democratic governance in Hong Kong. The Hong Kong people have enjoyed unprecedented democratic rights and greater freedom than ever before in their history. Five elections of the Chief Executive, the Legislative Council and District Councils have been held. And for six years, Hong Kong has topped the world's Human Freedom Index. All these achievements have not come easily. They are a source of pride and a cause for celebration. The theme set by the Hong Kong SAR government for the twenty-year celebration is "Together, Progress, Opportunity". This is a clear determination to join hands with the motherland to build a better tomorrow. "If two brothers are of the same mind, their strength can cut through metal". I believe that whatever difficulties lie ahead, these can be overcome as long as China's Mainland and Hong Kong work together. A promising future for Hong Kong will be created as long as we remain true to our shared Commitments, Constancy and Confidence. First, we must never waver in our Commitment to Hong Kong's prosperity and stability. The long-term prosperity and stability in Hong Kong serves the interests of all Chinese people, including the residents of Hong Kong. It is also in the interests of the international community. The premise for resolving the historical question of Hong Kong was restoring sovereignty. Based on this premise, the Central Government of China took into account the reality in Hong Kong and decided to keep the features and advantages of Hong Kong intact to the maximum extent. This has ensured continued prosperity and stability in Hong Kong. The 18th Party Congress reiterated the Central Government's policy goals with regard to Hong Kong. These include upholding national sovereignty, security and development interests and maintaining Hong Kong's long-term prosperity and stability. This is the Central Government's fundamental commitment to Hong Kong, which we shall never forget or contravene. Second, we must never waver in our Constancy to uphold the "One Country Two Systems" policy. The past two decades has seen the "One Country Two Systems" put into practice. In the Chinese language, coming of age at twenty is literally known as "young hat". "Hat" refers to the grown-up ceremony of putting on the hat and becoming an adult, while "young" indicates the tender body and formative age. The "One Country Two Systems" policy in Hong Kong is now at the age of "young hat". On one hand, this basic national policy has broken new ground for China's peaceful unification. Twenty years practice proves that this policy is attainable, feasible and amenable to the test of times. It has ensured Hong Kong's smooth return and continued prosperity and stability. It has helped promote the common development of Hong Kong and the motherland. On the other hand, the "One Country Two Systems" as a pioneering undertaking has no precedence to follow. Improvements are still needed to optimise its institutional- and mechanism-building. Some deep-rooted problems are yet to be resolved. However, we must stay true to our determination to follow through the policy of "One Country Two Systems". We must listen to the broadest possible views. We must engage in rational and in-depth communications. As long as we can do all these, we will be able to remove differences, build consensus and achieve new progress in implementing the policy of "One Country Two Systems". Third, we must never waver in our Confidence in a promising future for Hong Kong. Here are four reasons for my confidence. The first reason is the Chinese Central Government's unremitting support for Hong Kong. During this year's session of the National People's Congress, the Central Government of China made it clear that it will continue to step up efforts to support Hong Kong's development. More measures will be taken to ensure Hong Kong's long term prosperity and stability and to facilitate deeper cooperation between Hong Kong and the motherland. Such measures include the Hong Kong-Shanghai and Hong Kong-Shenzhen stock exchange connection. This year, a bond connection scheme will be piloted. Hong Kong's advantages are unparalleled. Hong Kong has geographical proximity to the mainland. Hong Kong benefits from the "One Country Two Systems". Hong Kong also enjoys the policy preferences that give Hong Kong the "license" to try out new things. All these unmatched advantages underpin Hong Kong's leading role in the increasingly intense international competitions. The second reason for my confidence is the Belt and Road Initiative and the development opportunities it brings. The Belt and Road Forum for International Cooperation was held in Beijing last week. This international gathering brought together 29 heads of state and government, 70 chiefs of international organizations and about 1,500 representatives from 130 countries. Focusing on "Cooperation for Common Prosperity", the Forum pooled the wisdom and strength of participants to plan for projects along the routes and to make a blueprint for win-win cooperation. During the Forum, action plans were made on infrastructure, energy and resources, industrial cooperation, trade and investment, and many other areas. Parties also set up joint working groups and investment cooperation centres to turn the leaders' consensus into action. China will contribute an additional 100 billion RMB to the Silk Road Fund. In the coming five years, China's import of goods is expected to reach eight trillion US dollars and out-bound investment 750 billion US dollars. These initiatives are evidence that China is playing a leading role in the globalization and injecting new dynamism into the global economy. The Belt and Road building also bears on the development of Hong Kong in the decades to come. As a financial centre, Hong Kong is a crucial gateway between China and the world. Hong Kong therefore has great opportunities at hand as it participates in the Belt and Road building. First, Hong Kong could serve as a financing platform as well as a centre of RMB business. By leveraging its status as a leading global financial centre, Hong Kong has a role to play in advancing RMB internationalization and the Belt and Road financing platform building. Hong Kong is already the world's offshore RMB hub. It is in a good position to expand RMB business in countries along the Belt and Road by offering investment, financing and asset management to infrastructure projects. It could also explore alternative financing channels for the Belt and Road Initiative. Second, Hong Kong could become a multiple-service centre for projects along the Maritime Silk Road. Hong Kong's location in the Guangdong-Hong Kong-Macau bay area gives it a unique advantage. The services Hong Kong could provide include laws, arbitration, accounting, design, consulting and so on. This will consolidate and further improve Hong Kong's strengths in the international division of labour. Third, Hong Kong could turn itself into a magnet for high-end R&D industries and talents. The Belt and Road Initiative aims, among others, to enhance cultural bond and mutual understanding. Hong Kong could focus on cultural and educational cooperation with countries along the routes and promote innovation, entrepreneurship and creative industry in Hong Kong. Now let me turn to the third reason for my confidence: the deepening of the "Golden Era" of China-UK relations. The "Golden Era" was unveiled in 2015 during President Xi Jinping's state visit to the UK. During that visit, our two countries jointly announced that China and the UK will build a global comprehensive strategic partnership for the 21st century. The "Golden Era" was reaffirmed last year by the leaders of China and Britain during the G20 Summit in Hangzhou. 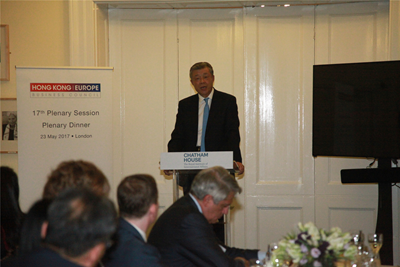 Our shared commitment to the "Golden Era" paves the way and maps out the future for China-UK relations. Hong Kong has close business and cultural ties with Britain. It has always served as an important bridge between China and Britain. Now that China-UK relationship is in the "Golden Era", we hope that Hong Kong will ride on the momentum of China-UK ties to achieve its own goal of further development. 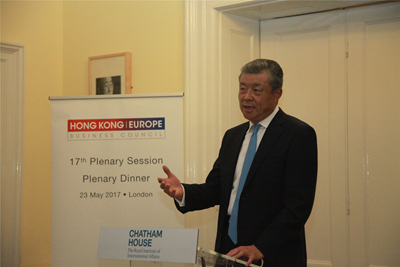 We also hope that Hong Kong will leverage its role as a bridge to contribute more positive energy to China-UK relations. The fourth reason for my confidence comes from Hong Kong's "Lion Rock Spirit". Hong Kong is a place where miracles never cease. Its success in turning a tiny fishing village into a world famous cosmopolitan centre should be credited to the "Lion Rock Spirit" of the Hong Kong people. This unyielding spirit highlights hard-working, solidarity, entrepreneurship and creativity. Looking into the future, there are both opportunities and challenges. But the "Lion Rock Spirit" will live on. The people of Hong Kong will continue to create more miracles. Hong Kong will embrace a better tomorrow. That tomorrow will be better." I always believe that tomorrow will be better, for Hong Kong, and for China-UK relations. So I would like to call on everyone to come together and work together. Work together for a better tomorrow for Hong Kong. And work together for a more splendid "Golden Era" of China-UK relations.